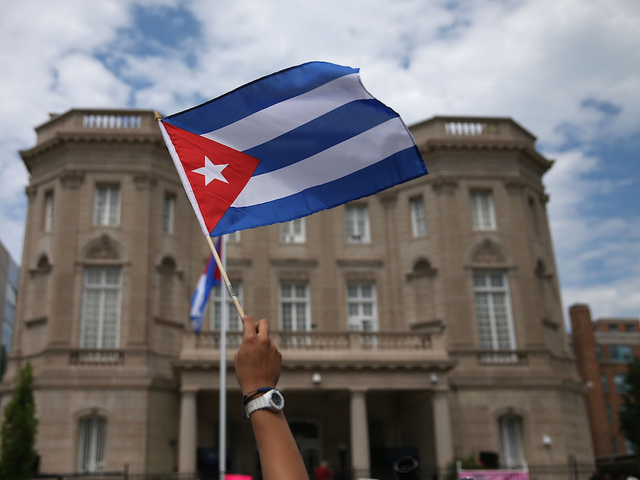 WASHINGTON, D.C. – Until yesterday, it had been 55 years since a Cuban flag waved outside of a stately three story limestone building located in northwest Washington, D.C. After President Dwight Eisenhower severed diplomatic ties with Cuba in 1961, the former embassy was essentially vacated, apart from a small Cuban Interest office that stayed in operation. Once its diplomats were ordered to leave the country, the building joined the ranks of a handful of ghost embassies left behind in the city–structures stripped of their foreign identity, shuttered and left to blend in along DC’s famous rows. An odd clause in the Vienna Convention on Diplomatic Relations is responsible for keeping these abandoned embassies standing. Countries are obligated to maintain diplomatic property even when ties between those states are cut. So while a particular country may still technically own its embassy building in D.C, it cannot re-claim it until diplomatic relations are restored and it can’t sell it. That leaves the U.S. to maintain the grounds, but without the power to do much else. Take the former embassy of Iran for example. Relations between the U.S. and Iran were severed in 1979 after the Iranian Revolution. You may remember the Academy Award winning movie Argo that documented the 444 day seizure of U.S. hostages at the U.S. Embassy in Tehran. The U.S. government responded by forcing the closure of Iran’s embassy in the U.S. The building hasn’t been used by the Iranian government since April of 1980 and is currently under the maintenance of the U.S. Department of State. Other properties abandoned by Iran include the residence of the Iranian military attaché and the residence of the Iranian Minister of Cultural Affairs—all located in Northwest D.C.
A few years ago a photographer was allowed to enter the residence and see what was left. The pictures he took showed a deteriorating interior of elaborate decorations, fallen chandeliers and fancy chairs stacked about—like they were waiting for the next party to begin. The other remaining ghost embassy belongs to Syria, which sits unassumingly on a corner plot surrounded by a tall fence. Most of its windows are barred, almost all the curtains are drawn and any insignia or crest to indicate its former tenants are gone. But it is still possible that either Iran or Syria’s embassies could open once again. Changing diplomatic relations are not uncommon over the course of history—just look at the evolving relations between the U.S. and Germany following WW II. When the U.S. joined the war, Germany’s ambassadors and diplomats were expelled and relocated to an inn in West Virginia in 1941 before being shipped back home. The German embassy was seized by the Justice Department’s Alien Property office and sold in 1951. When relations with Germany were restored in 1951, the country bought a new residence for its ambassador with $300,000 in compensation from the U.S and that embassy is still being used today.